Thought it was about time to do a wishlist, so here's a round up of things i want right now. PS. They should be clickable links, let me know if they're not! 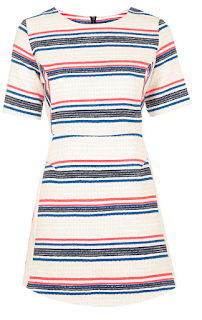 I don't own a lot of striped pieces in my wardrobe, but i'm loving this simple little number from Dorothy Perkins. I think bandeau dresses are perfect for summer, as it allows you to breathe a bit more in the heat, and also may allow you to get a cheeky tan on your shoulders if the weathers good. This tube skirt from New Look is an absolute beauty. I'm a big fan of tube skirts as i think they're just really easy to wear. I actually have a lot of plain coloured tube skirts in my wardrobe. 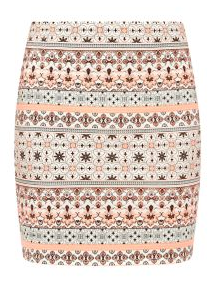 The print on this skirt is so festival-esque and is really eye-catching. I think this would look great with a white, off the shoulder top. I'm loving the layered necklace trend. I think it can really make a great addition to most outfits, as it can add some great detailing and can really make what you're wearing look more stand out. I really like all the little elements on this necklace as all the chains have a different charm on them making this necklace really interesting. This necklace is from Miss Selfridge. Well, this is exactly what it says. A plain white tee. I love the fact that this actually has what it is as a slogan kinda thing making it a lot more appealing. This to me, is a proper slouch about the house top as it's not fitted, but you can also get away with wearing it out too, and this makes it a winner in my books. 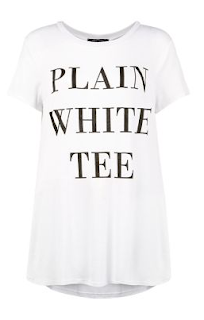 I think this tee from New Look would look great with a pair of ripped jeans and some pumps for Summer. 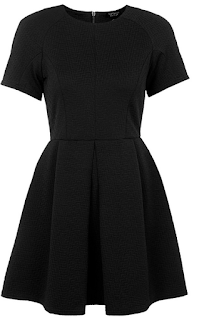 I saw this dress in the Miss Selfridge store and instantly fell in love with it. It's reasonably priced at £25 and i'm loving the fact it's a bardot off the shoulder dress. 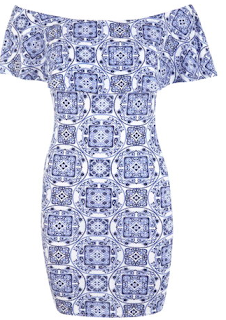 I think the print on this dress is fabulous! It's very me, as i find it quite dainty, yet i also find it a bit geometric due to all the shapes that you can see on it. My own personal dislike about this dress is that it's a bodycon, and they're something i rarely well as i feel too self-concious . I still love it though. Who doesn't love a pair of cat eye sunnies ay? I'm loving how classy they are, and i think they look a lot more expensive than the £13 they are selling for at River Island. I don't have a pair of sunglasses like this, and i actually just purchased a pair of aviators, but i am very tempted to claim these as my own because they are absolutely gorgeous! A little black dress, every girls must have. 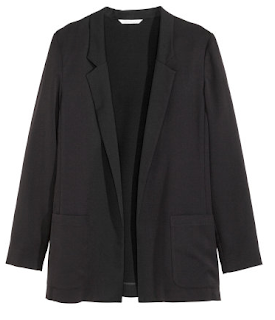 This one is frrom Topshop and i've decided that i need it in my life. It's a skater dress which is my favourite style of dress as i think it's most flattering on me, and it's black. What more could i want? My current LBD doesn't fit me as well as it used to, so i think it's time i invest in another one and this ones looking good. This would look great with a cream waterfall jacket. 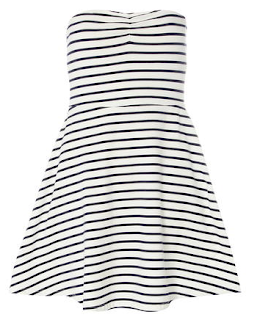 This striped jersey dress from H&M would be a great addition to my wardrobe for summer. I'm quite liking stripes at the moment, and i love how this dress is a bit quirky due to the way the stripes go the other way round when you get to a segment in the middle. I think this would look good with a nice pair of lace up sandals. 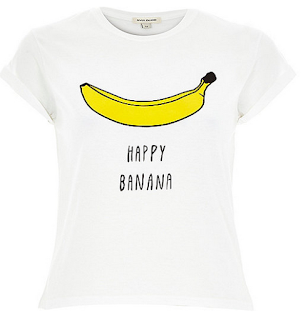 There is one reason, and one reason only to why i must have this top from River Island. That is because i want to be able to go up to people and say 'happy banana' in a minion voice. Yes, i'm obsessed with minions if you didn't already know! I do actually like the top as well though, and i think the brightly coloured banana is very eye-catching. This Topshop dress is probably my favourite out of this wishlist. I love the use of simple colours along with the stripes and i just think it's a stunning dress. If this was a skater dress it would be just perfect, but it's actually an A-line dress, though i think i would still wear it. This dress is a bit more pricey than the other things on here as it's £50. So if anyone would like to buy this for me it would be much appreciated. 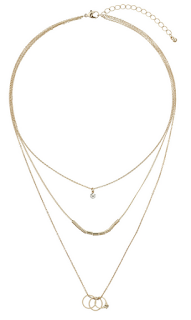 As i've already said above, i'm loving the layered necklace trend and i think this gold necklace from Topshop is lovely. It's very simplistic and i think that's what attracts me to it the most. I like the different detailing on each chain and i think it looks rather elegant. Every Summer I fall in love with River Island's sunglasses, they are gorgeous!